• There are, seemingly, an inexhaustible amount of stories today that we’ve heard over and over. The Giants bullpen collapsed. Washington is the best college football team this side of the Mississippi. Oregon is just marking time before making a coaching change. A WSU player’s legal troubles have thrown a wrench into the two-deep. The Seahawks’ Michael Bennett had a group of people in a tizzy. Instead of going into such occurrences individually, we’ll just ask you to keep reading. They are all covered in the links below. Except the Giants’ demise. You know how you never forget the teams of your youth? You also don’t forget the teams of your youth’s rivals either. And nothing makes you happier than to see them fail. It’s the dark underbelly of sports fandom. So when the Giants led by three headed into the ninth last night against the Cubs, it was a bit subdued in our house. When the Cubs rallied to win, it was if a light came on, brightening the world. And making it a happier place. Don’t get me wrong. I’m not a Cubs’ fan – though if they win the Series this year and end another silly curse, I won’t be upset – but there is that old saying: the enemy of my enemy is my friend. In the sporting world, it’s not just an old saying, it’s gospel. • WSU: On the football field, Jacob Thorpe has a story on the availability of UCLA quarterback Josh Rosen, who left last week’s game vs. Arizona State with injuries not once but twice. Whether Rosen (pictured), one of the conference’s better quarterbacks, will play is still to be determined. ... Off the field, Jacob has the story the Cougars will definitely be without linebacker Logan Tago, who has been suspended after being charged with a felony. Mike Leach had some comments about that. ... Jacob also offers his Pac-12 power rankings and another post-practice video, this one of defensive coordinator Alex Grinch. ... WSU was left for dead after an 0-2 start. But the Cougars live. How did that happen? ... Whoever plays quarterback for UCLA will probably hand off a lot as the Bruins try to get a meager running game in gear. ... The Washington State soccer team is having trouble finding the net. Jim Allen explains in his college notebook. Elsewhere in the Pac-12, Washington has a week off. While on their bye, the hype will only grow and add pressure, though the offensive line has handled everything thrown its way this season. ... Oregon also has a bye and that give everyone more time to parse Mark Helfrich’s future. ... California hopes its bye week will help it heal at key positions. ... Utah has lost running backs in almost every way possible this season, but the one who retired has decided to come back and could play this week against quarterback Darrell Garretson and Oregon State. ... 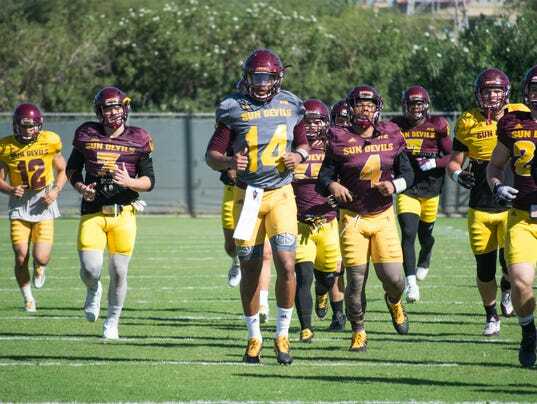 When Colorado meets Arizona State (pictured) on Saturday, the two starting quarterbacks will be anyone’s guess. That’s a big story in the South Division this season, quarterback injuries. ... Stanford doesn’t have any injuries at quarterback, but other places are rocked. The Cardinal expect to get some of the guys back for Notre Dame. ... Veteran-dominated USC has played itself back into the race and should get a boost from visiting Arizona, another team with injuries. ... This has already been an odd season. • Gonzaga: The Zags have a couple of the most compelling non-conference games on the college hoop schedule this season. ... The women’s golf team had a decent showing in the Harbottle Invitational. • EWU: Eastern Washington and coach Beau Baldwin are 5-1 to start the season, the only loss an overtime one on the road at top-ranked North Dakota State. But the Eagles are not satisfied as they enjoy their bye week. Jim Allen has more in this story. • Chiefs: Spokane picked up a 3-1 road win over the Seattle Thunderbirds last night. ... Everett also picked up a road win. • Preps: Lake City is this year’s Inland Empire League volleyball champion. Greg Lee has the coverage of the T-Wolves’ league-clinching win over Coeur d’Alene. ... We also have a roundup of other action from Tuesday and a look at the Washington state volleyball polls. • Seahawks: Tuesdays are NFL players’ day off, so they usually do something off the field. Russell Wilson visits Seattle Children’s Hospital and this week he brought along some Atlanta Falcons. 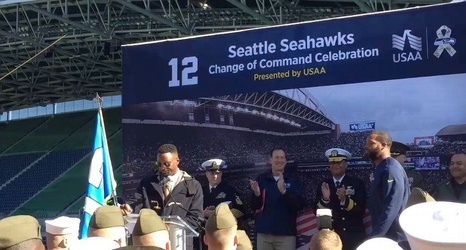 ... Michael Bennett stole the show yesterday at a military ceremony at CenturyLink. ... The offensive line’s most scrutinized player is happy for now. ... The practice squad has a fullback now. • Sounders: Win tonight against last-place Houston and the Sounders are in the playoffs. Who would have thought that was a possibility just a couple weeks ago?